Last Thursday evening, on the third floor of Temple University Hillel on Norris Street near 15th, Daniel Goldsmith told his story. 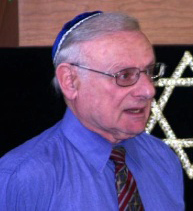 Goldsmith, 83, is one of about 40 students and Hillel employees who survived the Holocaust. Originally from Antwerp, Belgium, Goldsmith said his childhood was seemingly normal as during the start of World War II. Then, when the Nazis invaded Belgium in 1940, he said his life changed dramatically. As the Germans invaded Belgium on May 10, 1940, Goldsmith said he and his family tried to flee to Northern France, along with thousands of other Belgians. Within two years of the Nazi occupation of Belgium, strict laws against Jews had been issued regarding curfews, schools, clothing and businesses. Soon thereafter, Goldsmith said his father was ordered to go to a labor camp in France. After his father left, Goldsmith’s street was raided by the Nazis, he said. They blockaded his street and abducted Jews from his block in the dead of night. Goldsmith’s mother saved his sister and him by bringing them onto the roof of their house. “I quickly looked over and saw people being dragged in their night clothes, no luggage, nothing; being thrown into a truck,” he said. His mother decided that Antwerp was no longer a safe place for them to live, so she sent his sister and him to the countryside. Goldsmith said his sister, Lillian, was placed with a Catholic family where she remained for the duration of the war. His mother placed him in an orphanage on the border of Belgium and Holland, he added. Goldsmith said that after living in three different orphanages, he was captured after the Germans raided where he was living. “Since it was a boy’s orphanage, they had us all strip naked and only the Jewish boys were circumcised,” Goldsmith said. He said he was sent to three separate prisons until he was put onto a cattle car heading to one of the labor or concentration camps. He was in a car with some boys around his age, who escaped by opening a piece of the door with steel and jumping out. They then wandered into the closest town, where they went to a church for assistance—and that priest helped save their lives, Goldsmith said. Goldsmith added that following a few months of living with a Catholic family in the village After liberation, Goldsmith said he reunited with his sister and mother—but added that he would never see his father again. “Three different people came back and told my mother that my father was not coming back because he had died in Auschwitz,” Goldsmith said. Goldsmith said that although his difficult during the Holocaust, it’s important to be forgiving and learn from humanity’s mistakes. Max Buchdahl, a sophomore journalism major, facilitated the event. He said his inspiration for educating people about the Holocaust stems from his background. His family fled Germany, so he feels a personal connection. “It is important to me to continue Holocaust education because people from this generation by the time we have kids,” Buchdahl said. The sophomore said he plans to continue scheduling events like this in the future. Jonathan Gilbert can be reached at jonathan.irwin.gilbert@temple.edu or on Twitter @jonnygilbs96.